Burghley House is possibly the largest Elizabethan House in the country and while alterations were made to the interior decoration in the late 17th century the way the house was used remained unchanged for hundreds of years. The house was built for William Cecil, Queen Elizabeth’s High Treasurer, who served his queen for 40 years through what was an extraordinary and glorious period of English history. Life in a rich Tudor household was very different from that of the common person of the day. Our Tudor Days focus on aspects of the Daily Life of the Rich and the Poor. All Visits are for a Full Day however, you have the option of spending the afternoon in our extensive, 13 acre Sculpture Garden and the Garden of Surprises, making use of the educational resources we provide when you make your booking, or choosing one of our Tudor Workshops to continue your Tudor Theme. The availability of your Tudor Workshops will depend upon the size of your group. Your visit will be led by our education team dressed in period costume. You are very welcome, and we do encourage you, to make your visit in ‘Tudor costume’ to enhance your experience. We have some very simple costume guidelines which we can pass on for you to consider or we have one class set of ‘Tudor Style’ costumes which you are able to hire for £0.25 per child. We begin your tour by introducing your group to William Cecil, the man who built Burghley House. You will then be taken into the Tudor Kitchen and we will describe how the kitchen was used in the 16th century; who worked there, what they cooked, the dreadful life of the ‘spit boy’ and how bread and pies were baked. This will be followed by a guided through the house where we will consider how it would have been used in the Tudor times, ending your tour in the Great Hall which still retains a number of original features. Following the house tour we then look at a Tudor Dining Table, laid out for a rich person’s banquet and also for poor people so we can contrast the eating of rich and poor. We will discuss aspects of the food eaten, and some of the table manners you could expect to find at an Elizabethan banquet. If you decide to have a Tudor Workshop you may choose from the options below. Dr. Mort will explain some of the ‘niceties’ and not so nice aspects of medical care available during the 16th century. He will outline some of the philosophies and cures behind the treatment, and try a few on your ‘willing’ children! Most people in the Tudor times were not wealthy enough to visit the doctor. The Tudor Cunning Woman will explain all about healthcare for ordinary Tudor people, she will talk about illnesses and cures in the Tudor times and will explain some of the strange beliefs and superstitions which were an important part of Tudor life. She will also explain why it was a dangerous thing to be a Cunning Woman in Tudor England! Depending on group size, it may be possible for pupils to make a Tudor style good luck charm as part of this activity. The 16th century was a golden period for music in England with many fine composers such as Thomas Tallis and William Byrd coming to the fore. This session looks at some of the different instruments used at the time. The children will learn how they used music to entertain and we will teach some real Tudor Songs and how to dance the Pavane. Most poor people welcomed a visit from the pedlar to their village. They brought trinkets and ‘luxury’ items to brighten people’s daily lives in addition to everyday, useful objects. They also arrived with news and gossip from other places. The Pedlar will sit and unpack their wares and discuss with the children the contents of their pack. Leisure time was a part of everyday life for the rich and a luxury for the poor in the Tudor period. We will explore some of the Pastimes they enjoyed and in which they found entertainment. Your children will be taught how to play Merrelles, a Tudor board game, which is easy to learn but a challenging game to play well. Learn a little about money and clothing in the Tudor times, then make a Tudor style purse out of cambric and thong and decorate it with Tudor patterns to take back to school with you. A little talk about cloth production in the Tudor times followed by a short demonstration of spinning on a drop spindle or spinning wheel. Children will then have a practical session where they will learn to weave on a peg loom. Your children will question Henry VIII and from his answers learn about some of the significant events in his life, about his six wives and other important people. Sometimes the trial can get quite heated; but watch out for Henry’s temper, or you might find yourselves committed to the Tower for a trial of your own! An good session for pupils studying Burghley as part of a local history study. Mildred was William Cecil’s second wife, but she was also an interesting woman in her own right. Mildred was said to be one of the most intelligent women in Tudor England, she was a translator and she advised William Cecil on some of his most important work for Queen Elizabeth I. In this session Mildred will tell you when and why Burghley was built, as well as a bit about her life and work and that of her husband. Learn why Queen Elizabeth never came to Burghley house and what it was like to entertain her at William Cecil’s other house Theobalds. From the middle of November onwards we offer ‘Elizabethan Christmas Days’. Your children will learn about how the Rich and Poor celebrated Christmas as they go through this very enjoyable day. During the day we explore Tudor Christmas Customs and give the children the chance to taste ‘Frummenty’ a sweet, Tudor porridge and a forerunner of our Christmas Pudding. 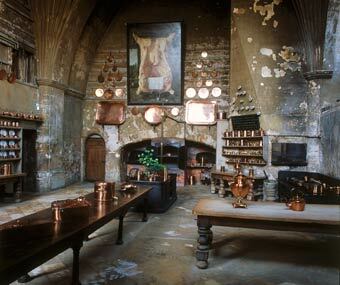 They will visit the Tudor Kitchen and learn about the Christmas Food eaten at the time by Rich and Poor alike. In the Great Hall we will play games, all with a Tudor flavour, under the guise of the Tudor custom of ‘King Bean and Queen Pea’. Your children will then enjoy a Tudor Ghost Story, told by candlelight in a period room and they will also have a choice of a Tudor Craft Activity; these have included making a ‘Tudor Rose Necklace’, a ‘Tudor Christmas Book’ or a ‘Tudor Pocket’ (drawstring purse).